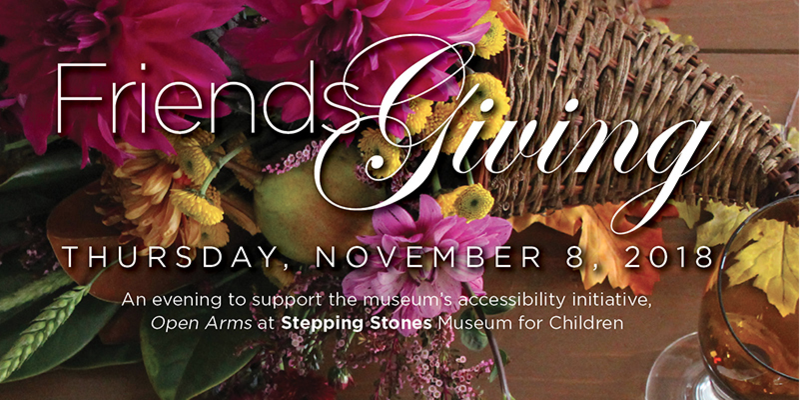 On Thursday, Nov. 8, Stepping Stones will be hosting is third annual FriendsGiving fundraiser at the museum in Norwalk’s historic Mathews Park. Proceeds from the event will support Open Arms initiative. At the heart of Stepping Stones Museum for Children is an unwavering commitment to inclusion. That commitment is embodied by the award-winning children’s museum’s Open Arms Accessibility Initiative, which provides thousands of children, caregivers and teachers each year the opportunity to enjoy the museum regardless of financial, language, cultural or special needs barriers. The festive fundraiser brings together friends old and new for an enjoyable evening featuring a special signature cocktail, hors d’oeuvres and networking hour beginning at 6:30 p.m. followed by an intimate harvest dinner, based on a delectable, Thanksgiving-inspired menu from Marcia Selden Catering and Events at 7:30 p.m.
“This exquisite fine dining experience will leave your heart warmed and a great number of local children and families deeply thankful for your role in making sure that the best educational opportunities are available to all children,” said Rhonda Kiest, CEO and President of Stepping Stones Museum for Children. “Now, more than ever, as many families face greater challenges, it is vitally important we continue to receive financial support for Open Arms,” she said. Stepping Stones is an inviting, welcoming and diverse learning community which values and celebrates all children and families for their similarities and uniqueness, broad-ranging abilities, experiences, interests, needs and perspectives. Many children and their families would not have access to the museum without Open Arms. In 2018, Open Arms will serve more than 75,000 children, caregivers and teachers throughout the region. Through this mission-critical accessibility initiative,Stepping Stones is able to offer monthly free admission evenings, free Family Membership program, year-round free admission for active-duty military families through the Blue Star Museums program, reduced-admission for Electronic Benefit Transfer (EBT) cardholders through the Museums for All program, free admission days for families of children with special needs and a host of other important and engaging educational opportunities for children, families, Title 1 schools and community partners. “FriendsGiving is a special time for gathering with museum friends to give thanks for our many blessings this past year, explore the museum’s bright future, and renew our dedication to accessibility,” said Kiest. The mission of Stepping Stones Museum for Children is to broaden and enrich the educational opportunities for children ages 10 and under and enhance their understanding of the world. The museum seeks to create an environment that inspires lifelong learning and supports parents, caregivers and educators as facilitators of children’s explorations. Space for FriendsGiving is limited. Single ticket prices start at $275 and a table of eight can be reserved for $2,250. Special pricing for members is $250 per ticket. “Our first two FriendsGiving events were wildly successful as guests enjoyed scintillating conversations, delicious cocktails and a spectacular farm-to-table dinner in a setting that evoked the charm of a quintessential New England farm,” saidFriendsGiving Event Chair Kris Granetz of Wilton. FriendsGiving is made possible by Diamond sponsors the Foster Family Fund and Kris and Marc Granetz, Platinum sponsor Marcia Selden Catering and Events, Gold sponsorthe Aiello Foundation and Silver sponsor First County Bank. Additional sponsorships are available and designed to celebrate and honor corporate and personal commitments to Stepping Stones Museum for Children. For information about opportunities, please contact Kristen Welton at 203-899-0606, ext. 207 or visitwww.steppingstonesmuseum.org/friendsgiving. Stepping Stones Museum for Children is an award-winning, private, non-profit 501 (c)(3) children’s museum committed to broadening and enriching the lives of children and families. For more information about Stepping Stones, to book a field trip or schedule a class, workshop or facility rental call 203-899-0606 or visit www.steppingstonesmuseum.org. Stepping Stones Museum for Children is located at 303 West Avenue, Norwalk, CT, exit 14 North and 15 South off I-95. Museum hours are: Labor Day through Memorial Day, Tuesday-Sunday and holiday Mondays from 10 a.m. to 5 p.m.; and Memorial Day through Labor Day, Monday to Sunday from 10 a.m. to 5 p.m. Admission is $15 for adults and children and $10 for seniors. Children under 1 are free. Get social with Stepping Stones on Facebook, Twitter or Instagram. For over 30 years, Marcia Selden Catering has been creating unique events with an accent on extraordinary food, creativity, and highly polished professional service. The business is a family affair. From her Stamford headquarters, Marcia, with daughter Robin, son Jeffrey, and a team of dedicated and experienced party planners and chefs, work together to create “dream” events. They are proud supporters of marriage equality, and understand that a great party celebrates life’s milestones and believe in the host’s privilege to avoid stress and enjoy every minute. Whatever your desire, whether it’s a low-key clambake on the beach, a lavish over-the-top wedding, or anything in between, they will create a special memory that you and your guests will remember for years.